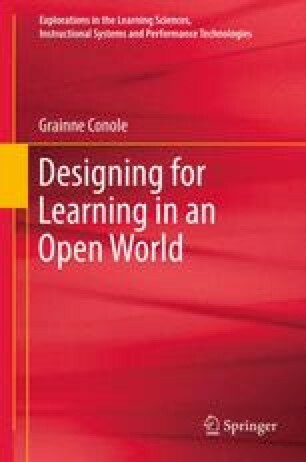 This chapter takes a particular position on the notion of ‘openness’, considering it from a broad perspective covering each major phase of the academic lifecycle, namely, design, delivery, evaluation and research. What would a vision of a truly open approach to design mean, beyond open educational resources towards a more explicit representation and sharing of the whole design process? With a shift towards more open learning and teaching practices, the boundaries between traditional, formal educational contexts and other non-formal and informal learning contexts are changing. What would adopting a more open approach to delivery mean? In terms of open evaluation, how can we harness and utilise the data we collect about learners on our courses? How can we build on the understanding developed as part of the learner experience research work and the associated new methodologies? What new methodologies and approaches might we develop to gain new insights into the impact of a changing technological context for learning? What will be the impact of the open access movement for research? How can we capitalise on the rich research data, which is now being made available on a global scale? How can we move to adopting more open approaches to research, open bibliographies and citations, making research outputs available online? What would it mean to make raw data publicly available for others to interrogate and use? Anderson, P. (2007, February). What is Web 2.0? Ideas, technologies and implications for education. Citesser, JISC Technology. Standards watch. Available online at http://www.jisc.ac.uk/media/documents/techwatch/tsw0701b.pdf . Accessed 11 Aug 2011. Bartolomé, A. (2008). Web 2.0 and new learning paradigms. Retrieved from http://www.elearningeuropa.info/out/?doc_id=14603andrsr_id=15529. Accessed 21 Sept 2011. Burton, G. (2009). The open scholar. Academic Evolution. Retrieved from http://www.academicevolution.com/2009/08/the-open-scholar.html. Accessed 21 Sept 2011. Conole, G. (2007, October 20). The nature of academic discourse, e4innovation blog post, http://e4innovation.com/?p=45. Accessed 7 Oct 2011. Fini, A. (2009). Technological dimensions of a Massive Open Online Course: The case of the CCK08 course tools, IRRODL, 10, 5. Available online at http://www.irrodl.org/index.php/irrodl/article/viewArticle/643. Accessed 7 Oct 2011. Freire, J. (2008). Universities and Web 2.0 institutional challenges. Retrieved from http://www.elearningeuropa.info/out/?doc_id=14604andrsr_id=15530. Accessed 7 Oct 2011. Katz, R. (2008). The tower and the cloud: Higher Education in the age of cloud computing, an Educause ebook. Available to download from http://www.educause.edu/thetowerandthecloud. Accessed 7 Oct 2011. Lyon, L. (2003). eBank UK: Building the links between research data, scholarly communication and learning, Aridane, 36. Available online at http://www.ariadne.ac.uk/issue36/lyon/. Accessed 20 Nov 2006. McAndrew, P., Scanlon, E., & Clow, D. (2010). An open future for higher education. Educause quarterly report, 33(1). Available online at http://www.educause.edu/EDUCAUSE+Quarterly/EDUCAUSEQuarterlyMagazineVolum/AnOpenFutureforHigherEducation/199388. Accessed 7 Oct 2011. Newbould, D. (2010). Comment on draft chapter. From http://www.slideshare.net/grainne/chapter-16-open-practices. Accessed 7 Oct 2011. O’Reilly, T. (2004, 2011, January 17). The architecture of participation. Available online at http://www.oreillynet.com/pub/a/oreilly/tim/articles/architecture_of_participation.html. Accessed 11 Aug 2011. Pearce, N., Weller, M., Scanlon, E., & Kinsley, S. (2010). Digital scholarship considered: How new technologies could transform academic practice. Education, 16(1). Available online at http://ineducation.ca/article/digital-scholarship-considered-how-new-technologies-could-transform-academic-work. Accessed 7 Oct 2011. Siemens, G. (2008, November 24). Who is still participating?, blog post. Available online at http://ltc.umanitoba.ca/connectivism/?p=182. Accessed 7 Oct 2011. Siemens, G. (2009, August 11). Connectivism and connective knowledge 2009. Available online at http://ltc.umanitoba.ca/connectivism/?p=189. Accessed 7 Oct 2011. Weller, M. (2009). Reflections on openness. http://nogoodreason.typepad.co.uk/no_good_reason/2009/09/reflections-on-openness.html. Accessed 7 Oct 2011. Wiley, D. (2008, July 18). The “Wiley WIKI design”, Opencontent blog posting. Available online at http://opencontent.org/blog/archives/514. Accessed 7 Oct 2011. Wiley, D. (2010). Why bother being open? http://opencontent.org/blog/archives/1735. Accessed 7 Oct 2011. Wiley, D. (n.d.). E-learning and openness. Retrieved from mediastudio.unu.edu/download/wiley.ppt. Accessed 7 Oct 2011.